If you are looking for information on the Jerry's Subs and Pizza franchise business opportunity, Jerry's Subs franchises, Jerry's Pizza franchising or Jerry's franchise, then you have come to the right place. Jerry's reputation as the premier franchise for World Famous Cheesesteaks and Authentic New York Style Pizza is well deserved. A great franchise opportunity begins with great products, and our products are unmatched by our competitors. Great food always evokes emotion. It's the cornerstone of our reputation, and the reason people get excited about Jerry's. Jerry's is more than a sandwich shop. It is more than a pizza shop. It is America's two hottest franchise concepts rolled into one. 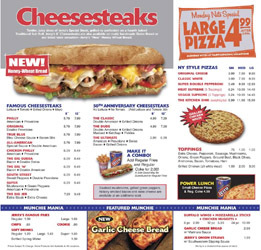 In addition to our signature line of specialty cheesesteaks, our menu features a variety of overstuffed subs, pizza, and related food items that are both delicious and unique. Our store design utilizes a variety of exciting visual elements that showcase our products in a way that says "quality" to our customers. "Fast Casual" is the new industry buzzword. It describes a style of quick service restaurant that caters to more sophisticated adult tastes. More than just burgers and fries served in a largely plastic environments, "Fast Casual" concepts feature food that is tastier and store environments that are more interesting and comfortable. Jerry's has been positioned as a "Fast Casual" concept since our "Contemporary Casual" prototype was unveiled in 1981. Our new "Ultra II" design prototype sets the standard for the Jerry's of the future. Jerry's is not just the latest franchise fad. We have stood the test of time, as our record of steady growth proves. Since our first store opened in 1954 outside Washington, D.C., we have remained dedicated to providing our loyal customers with the same high quality ingredients and overstuffed portions that have established us as the East Coast's #1 sub and pizza chain. Now with over 140 stores in 9 countries, we are poised to grow even more. Jerry's is an established franchise system which will provide you with all of the resources you need to develop your own successful business. Our knowledge and expertise combined with the entrepreneurial skills and energy of our franchise owners creates a highly successful partnership. If you're ready to take control of your own financial future, you owe it to yourself to take a closer look at what Jerry's has to offer! Choosing the right franchise is not easy. There are thousands of concepts all claiming to be the latest and greatest. What should you look for in selecting the right opportunity for your investment dollars? Sandwich chains serve sandwiches, primarily a lunchtime product. Pizza chains serve pizza, primarily a dinnertime product. Jerry's dual product line of both Subs and Pizza meet customer needs for both lunch and dinner day parts, thereby maximizing the sales potential of each franchise location. An optional breakfast program is also available for suitable locations. World's Best Cheesesteaks are the core of our sandwich menu. Many sandwich chains don't even offer a cheesesteak. Those that do often claim to have the best. Talk is cheap. Jerry's cheesesteaks are authentic: real slices of steak cooked to order on the grill. Not precooked meat held in a steamtable. Not microwaved. Jerry's is frequently the only concept that actually serves its cheesesteak at industry trade shows and franchise expositions. That should tell you something. Our cheesesteaks are made with a special cut of 100% Grade A USDA Choice beef that is sliced and seasoned to our exacting and proprietary specifications. Always tender. Always tasty. Quality beyond compare. We put our money where your mouth is! World Class Cheesesteaks. Famous Overstuffed Subs. Authentic New York Style Pizza. Jerry's serves truly memorable food that is made with only the highest quality ingredients. Our commitment to quality is the fundamental strength of our concept. Our products are not the cheapest, but they are the best. That is why our store continues to out-perform our more well known competitors in trade areas where we compete head to head. Great food is an important part of the success equation. But servicing customers effectively is equally as important. Fast service that produces great food consistently and efficiently is critical to building a profitable business. Our operating system is designed to be labor efficient. Although all of our products are made to order, we have developed a food production system that is capable of handling the demands of peak hours during lunch and dinner. Yet our system is also designed to provide good customer service during off-peak hours with minimal labor requirements. Effectively managing labor costs is an especially critical component of today's profitability structure. But efficiency cannot be at the expense of consistency, and we have worked hard to develop a system that maximizes the consistency of every product served. Consistency promotes repeat visits, and repeat visits build a business. Managing labor costs without compromising the customer experience is another measure of the value of a quality franchise opportunity. Again, Jerry's sets the standard. Jerry's provides each franchisee with a comprehensive array of support services relating to every aspect of the unit development process. This development process does not end on opening day, as our marketing and operations departments provide support and consultation to franchisees on a regular and continuing basis in order to help them continue to build a successful business. Our advertising and marketing department knows how to get attention. From top-notch collateral materials that catch the customer's eye, to radio commercials that have received national recognition including several awards from the National Restaurant Association, Jerry's can provide you with the advertising and marketing support that will help you build a successful business. Great Products. Attractive Stores. Effective Advertising. Comprehensive Support. Just a few of the reasons why we hope you will choose to learn more about us.